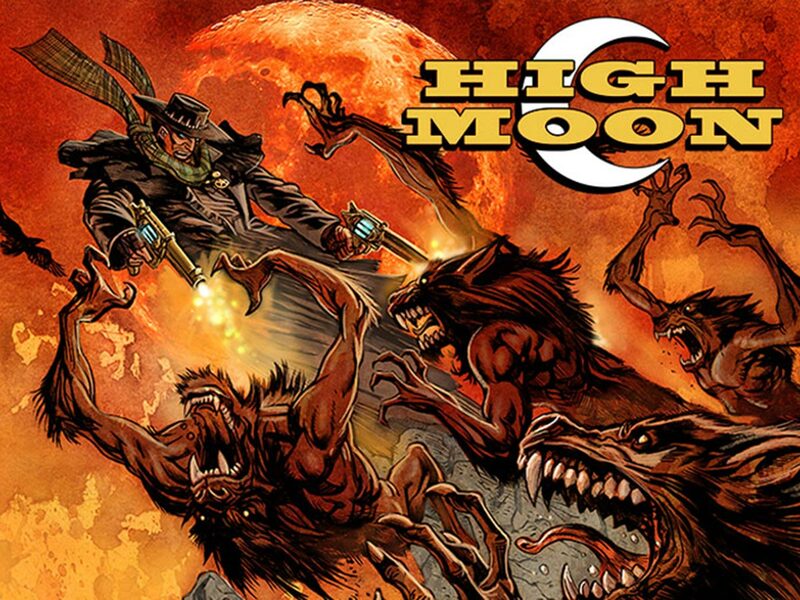 The popular and pioneering series High Moon by writer David Gallaher and artist Steve Ellis has returned online. The Harvey Award winning webcomic combines the western and horror genres to create a “Stephen King vs. Sergio Leone mash-up” that impressed fans and critics alike when it originally launched eight years ago as part of DC Comics’ initiative ZUDA Comics. The HighMoonComic.com site has launched with the first 8 pages of the story and will now be serialized by Bottled Lightning Inc, the creative studio run by Gallaher and Ellis, with 4 new pages running every Monday. Later this year, the site will debut original content continuing the High Moon saga. In High Moon, former Pinkerton agent and current bounty-hunter Matthew Macgregor investigates a series of strange happenings in a small Texas town. Drought has brought famine and hardship to Blest. The summer heat pushes the temperature to unbearable heights during the day. The nights are even worse– for the streets are haunted by strange, unnatural creatures. And even as Macgregor works to uncover the truth about the creatures, he struggles to keep his own supernatural nature a secret. This is the second webcomic to be serialized by Bottled Lightning Inc, following the young adult webcomic The Only Living Boy which launched last year. The series will be available on the new mobile-responsive HighMoonComic.com site, Tapastic and Comixology; readers can support Bottled Lightning via its recently launched Patreon Fan Club. This is the second high profile series to go from print to digital. It was almost a month ago when it was announced that Brian Clevinger and Scott Wegener‘s Atomic Robo would be switching to digital first, then eventually make it to print as trade paperbacks.